Recreational boat sales stayed on a level growth plane in April, helped by spring weather that was improved from a year ago, particularly in the upper Midwest. Sales for the month rose 6 percent to 13,778 boats from April of last year in the main powerboat segments and 8.2 percent to 20,144 boats industrywide in 31 states that represent 68 percent of the U.S. market, Statistical Surveys reported. In March, sales rose 7 percent in the main segments and across the industry. 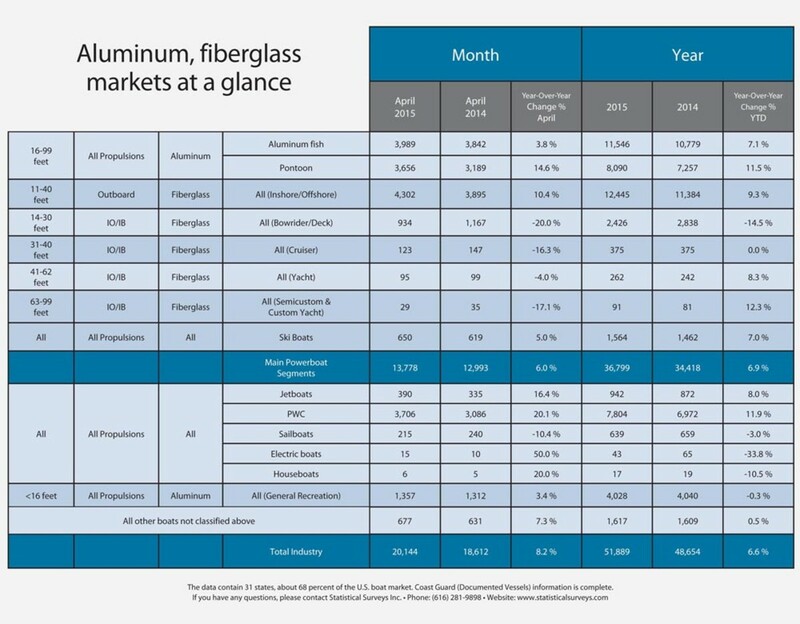 Sales in April climbed 24 percent in Michigan, 23 percent in Florida and 21 percent in Minnesota as buyers took advantage of favorable early-season weather to purchase aluminum pontoons and fishing boats, small to midsize outboard fiberglass boats, and jetboats and personal watercraft. Kloppe said lakes in Michigan and Minnesota that are often still frozen over in April were not this year, encouraging more boaters to take to the water sooner. Fiberglass outboards were the top seller in the main segments, rising 10.4 percent to 4,302 boats. Pontoons had the highest gain by percentage, rising 14.6 percent to 3,656. Sales of aluminum fishing boats rose 3.8 percent to 3,989, but sales of 14- to 30-foot inboard and sterndrive boats continued to struggle, falling 20 percent to 934. Sales of personal watercraft rose 20.1 percent to 3,706 and jetboat sales climbed 16.4 percent to 390. Kloppe said the top states for jetboat and PWC sales in April were Florida, Texas, Michigan and Minnesota. Florida (3,373) and Texas (2,225) were the overall sales leaders in the early-reporting states, followed by Michigan (1,882), Minnesota (1,758) and North Carolina (1,081). The rest of the top 10 were New York (890), South Carolina (746), Tennessee (714), Ohio (677) and Arkansas (643). Among the bigger-boat categories, sales of 31- to 40-foot cruisers fell by 24 to 123 and sales of custom and semicustom yachts of 63 to 99 feet fell by six to 29. Sales of 41- to 62-foot yachts fell by four to 95. Sales of ski boats rose by 31, or 5 percent, to 350. Sailboat sales fell by 25, or 10.4 percent, to 215. This article originally appeared in the July 2015 issue.